The Thrift Shop serves the Huntington Community and is located in the lower level of the church (from Main Street, follow the brick path in the Garden of Blessings to the entrance of the shop). 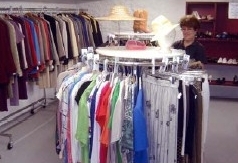 It is staffed by at least two volunteers who sort, price, and sell items of clothing donated to the shop. The Thrift Shop regularly runs sales and specials so come visit. The clothing is priced affordably for shoppers of limited means and occasionally donated outright to persons referred by the Clergy, social agencies, or parishioners aware of a special or emergency need. 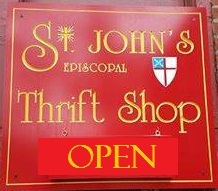 Because the Thrift Shop is run entirely by parishioners on a volunteer basis, it may be closed during inclement weather or on holiday weekends. We recommend that you call before making a trip to to find out whether it is open or not. Call us at 631-427-1752 ext. 17.